[SatNews] Turned the company into profit in her first quarter at the company and continued the profitability for 12 consecutive quarters. In the year 2013, the company has announced a consolidated net profit of 1.1 billion Baht, an increase of 548 percent over the previous year. Thaicom’s CEO Suphajee Suthumpun has been named ‘Satellite Executive of the Year in the Asia-Pacific’ by the Asia-Pacific Satellite Communications Council (APSCC). Suphajee Suthumpun was recognized at the organization’s tenth annual awards ceremony, which took place at the JW Marriott Phuket Resort & Spa, in Phuket, Thailand, as part of the APSCC’s 2014 Satellite Conference and Exhibition, ‘New Landscape For Satellites: Asia and Beyond’. 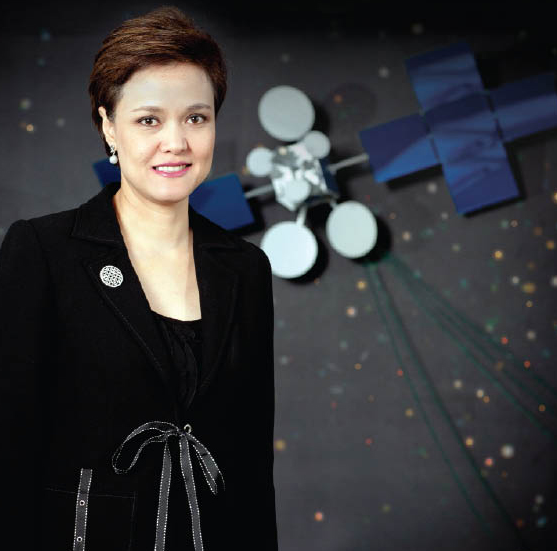 Appointed as the CEO of Thaicom in August 2011, Suthumpun turned Thaicom into profit in her first quarter at the company. Since then, she has managed to continue the profitability for 12 consecutive quarters. In the year 2013, the company has announced a consolidated net profit of 1.1 billion Baht, an increase of 548 percent over the previous year. Under Suthumpun’s leadership, Thaicom has been focusing on developing and implementing strategic directions with an aim to grow profitably and sustainably. The company has three new satellites; Thaicom-6, which was launched in January 2014; Thaicom-7, which was launched on September 7th this year; and Thaicom-8, which will be launched by the first half of 2016. In addition, Thaicom has been moving into new territories, namely Africa. The company also now focuses on providing end-to-end solutions, such as the first high speed Ku-band In-Flight connectivity in Asia-Pacific. Thailand’s number one premium low cost airline Nok Air launched the service on September 23rd. APSCC is a not-for-profit organization which works to promote communications and broadcasting via satellite, as well as outer space activities, in the Asia-Pacific for the socioeconomic and cultural welfare of the region. The APSCC Awards recognize companies and individuals who have made significant contributions to the satellite and space industry. Recipients are acknowledged for their innovations and achievements, as well as their leadership in developing and expediting the distribution of new services via satellite in the Asia-Pacific region. THAICOM Public Company Limited, an Asian satellite operator, was established in 1991, was the first to launch a broadband satellite in the world, and is a leader in developing integrated solutions for satellite broadband and broadcast services. The Company’s engineering teams provide solutions for satellite-based telecommunications services. Since its establishment the Company has launched seven satellites, with four satellites in operation: Thaicom-4 (IPSTAR) provides a variety of broadband and data services, including cellular backhaul, mobility, government USO support, content delivery, business continuity and emergency services in thirteen countries in Asia Pacific. Thaicom-6 is to expand the Company’s broadcast carrying capacity in SE Asia and Africa (by the name “Africom-1”) and is collocated with Thaicom-5 at 78.5 degrees East; the satellites board a combined 700 TV channels both in SD and HD formats. Thaicom-7 was launched in September 2014 to provide media and data services for Asia’s and Australasia’s entertainment and telecom industries at 120 degrees East. Thaicom-8 will be launched in 2016 to expand Thaicom’s servicing capacity and footprint in the region.